Factory Heckler & Koch P30SK/VP9SK 9mm 10RD magazines. Featuring metal construction, blued finish, made in Germany. Exactly what I was looking for for my VP9SK. 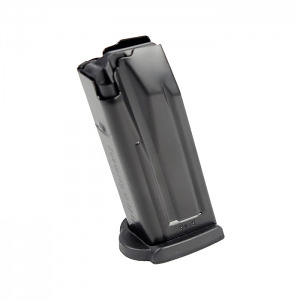 Factory 10 rd magazine without added lower grip for better concealment. I recently ordered an add'l mag for my pistol, the price was excellent considering it's an HK, $20 less than everyone else, service was even better---I recoeved my item in 3 days and I didn't pay extra for shipping---definitely will be a repeat custumer, great products, great prices, great shipping! Great prompt service magazines are just like the factory mags that came with the gun and the price was right on compared to others. Top Gun will definitely be my choice for future purchases. Top Gun Supply comes through again. Great product and excellent service as always. Product shipped right away and I received it within 2 days. I’ll be back again for sure! These are the factory 10-rnd flush magazines. I received these promptly and efficiently.